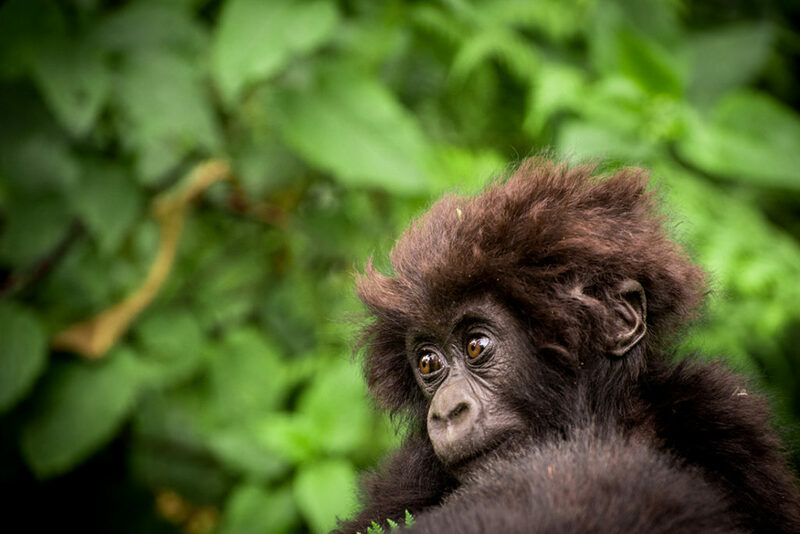 The Grauer’s gorillas the Fossey Fund protects in eastern Democratic Republic of Congo live deep in primary forest, where our trackers hike for days to reach them, then follow their trails through slopes and ridges, across rivers and streams, searching for their nests made the night before. 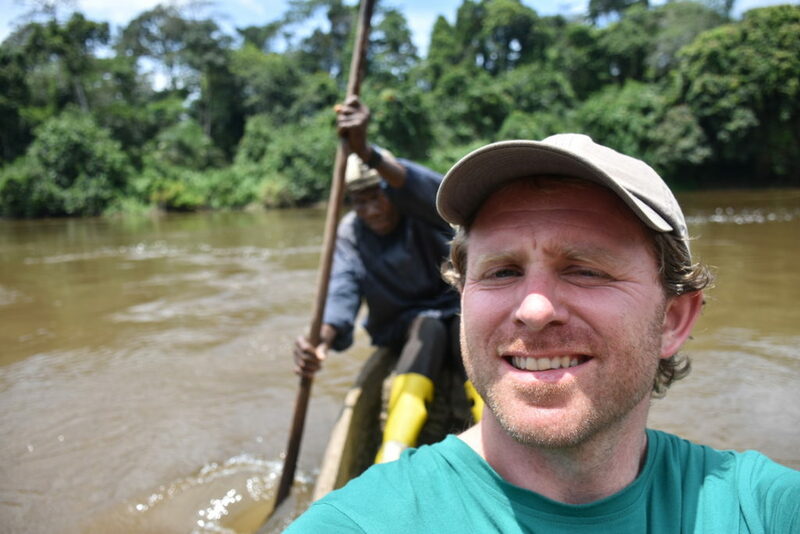 Here, Dr. Yntze van der Hoek, who joined our staff in 2018 as biodiversity researcher, describes his first journeys with our Congo trackers. “We follow the vague trail of slightly brushed leaves and nibbled-on twigs up on a ridge. 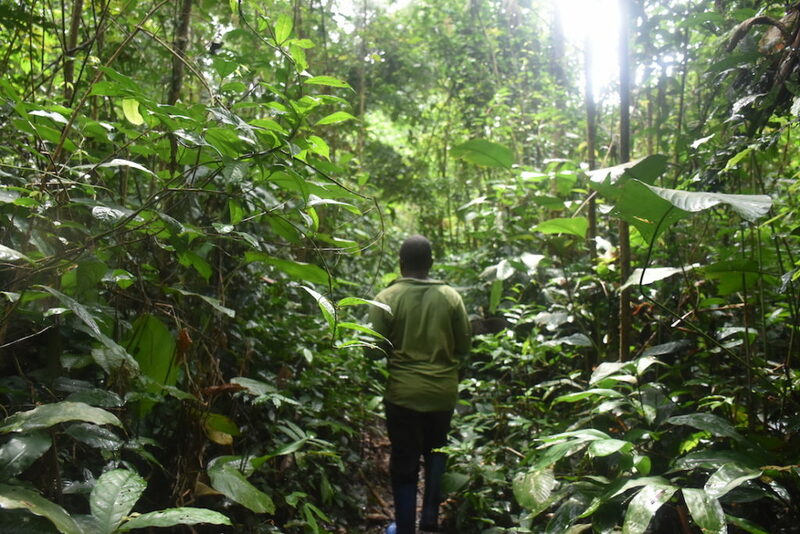 We are in a primary forest in eastern Democratic Republic of Congo, and have followed the sometimes hardly visible track of a group of critically endangered Grauer’s gorillas. We’ve been up and down slopes for several hours, and although the only goal is to find last night’s nest site, there is no sign we are nearly done for the day yet. My boots are getting uncomfortable, and I am sweating everywhere. After nearly seven hours, as we make another descent towards one of hundreds of little rivers crossing this vast forest, I get a tap on the shoulder. 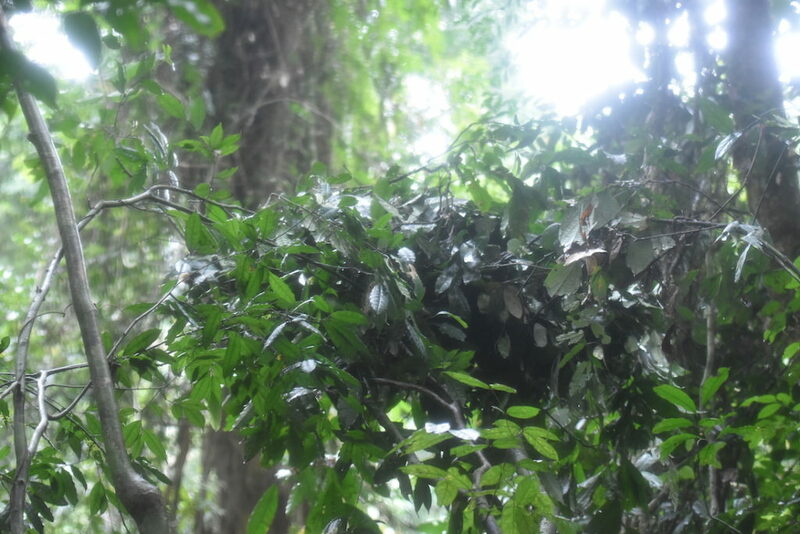 Looking up, I see the smaller arboreal nests that are usually made by infant and female gorillas, hovering above the forest floor. We made it. For me, one day like this is already tough on a body that has lingered in an office far too long these past weeks. 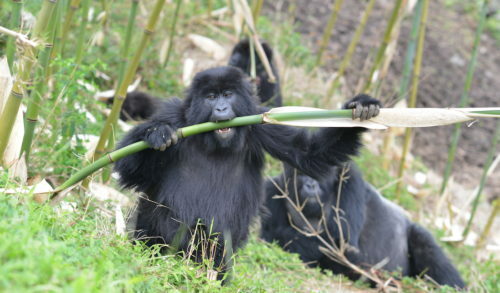 But for our field staff in Nkuba, Congo, this is a daily routine. 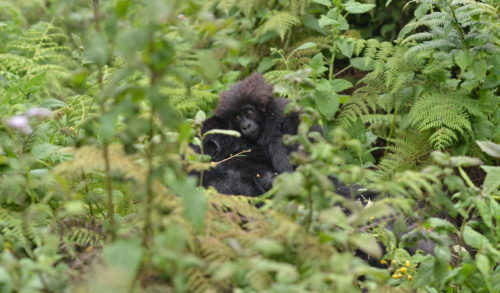 Thanks to our very skilled field staff, we get to track these gorillas and gather the data we need to understand their behavior and ecology, and to efficiently protect them. I had a sliver of hope those data would include a brief direct observation, an internal motivator when the going was tough. 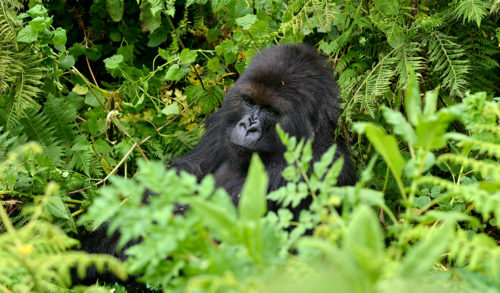 But today’s bounty is restricted to records of food items, movement patterns, and nest locations, as well as some very fresh silverback gorilla poop, which is just as interesting for science, perhaps a slightly less emblematic experience than my secretly envisioned direct encounter with unhabituated gorillas. Back in camp, I reflect on the forest I have seen around me. 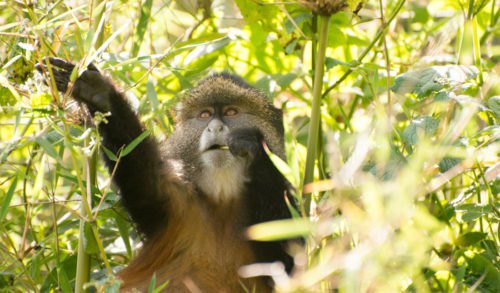 This home to the Grauer’s gorilla is also host to other near-mythical mammals, including chimpanzees, giant pangolins and a variety of antelope. It harbors exciting bird species, such as the Bates’ paradise flycatcher and white-crested hornbill. 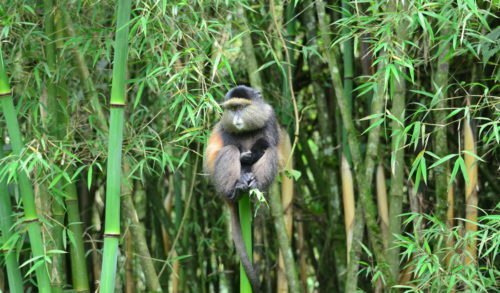 It contains giant trees and is full of marvelously adapted insects. But more than a gathering of organisms this forest showcases what a tropical rainforest is all about: being a complex web of interactions. 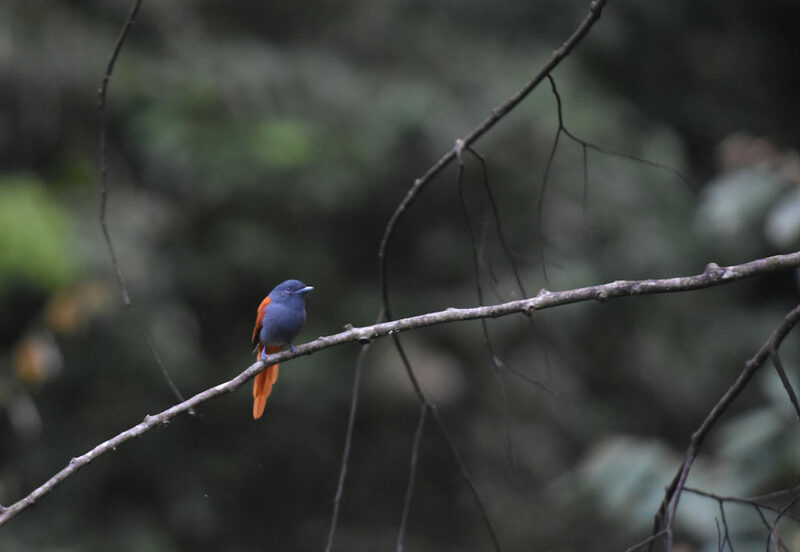 A Bates’s paradise flycatcher (Terpsiphone batesi) visits a rare open spot in the forest, hoping for some insect activity. The Eastern long-tailed hornbill (Horizocerus cassini) does not let itself be photographed easily, high up in the forest canopy. Every resource counts, sunlight is an especially valued currency, and adaptations for survival can be seen all around — cooperation, predation, competition, defense. Camouflage is a chart-stopping adaptation, as are spines, rapid growth, and extreme specialization. And efficiency is a trait shared by all, exemplified by the fungi, who return resources to the forest system. 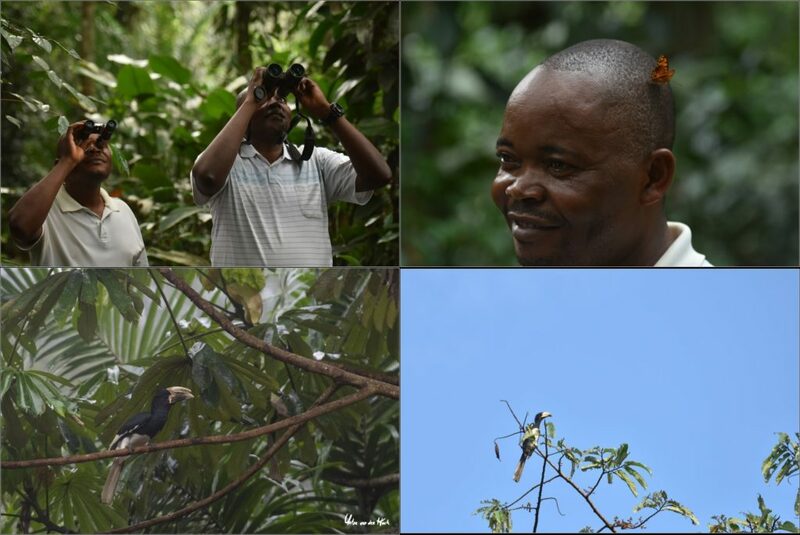 “Although we have just started and covered only a small part of the forest, we are already counting way more than 60 species of birds! I wonder what number we will end up with over the coming year – 100, 150, 200! 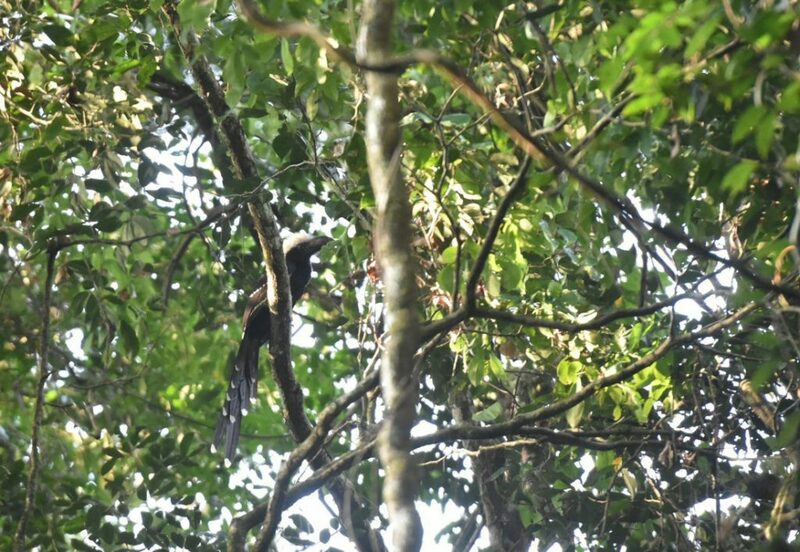 Just today we’ve seen four type of hornbills….